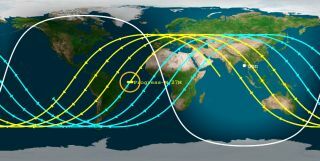 This Aerospace Corporation map shows the potential re-entry paths of Russia's doomed Progress 59 spacecraft, with re-entry plots for Friday, May 8 at 1:40 a.m. ET (0540 GMT), plus or minus 5 hours. Russia's unmanned Progress 59 spacecraft is seen being prepared for its April 28, 2015 launch. The spacecraft later suffered a major malfunction after reaching orbit. "The ESA space debris team re-entry predictions now show the re-entry window has shrunk to include just the night of Thursday/Friday, 7/8 May," European Space Agency spokesman Daniel Scuka wrote in an update today. "We can exclude any time after early Friday morning. There are some first indications that the likelihood for a re-entry over North America or Europe has dropped significantly." The problems with Progress 59 began shortly after liftoff, when the spacecraft experienced technical difficulties – perhaps due to a malfunctioning Soyuz rocket third stage. Video from a camera on Progress 59 showed the craft to be spinning, leaving Russian ground controllers unable to command the vehicle as it tumbled through space. Since then, Russia's State Commission for manned space complex flight tests has formed a board to review the Progress supply craft mishap. The conclusions are expected to be made by May 13, according to Roscosmos. The falling Russian spacecraft Progress 59 is seen streaking overhead in this view from the Brazilian Meteor Observers Network (BRAMON) on May 2, 2015. The spacecraft is expected to fall to Earth overnight on May 7/8. Veteran satellite observer Ted Molczan of Canada places the re-entry of the Progress as occurring later tonight, May 7, at about 10:03 p.m. EDT (0203 May 8 GMT) as of Thursday afternoon. The uncertainty is 1.9 hours, Molczan said, given a number of factors, including the influence of space weather and its impact on the density of Earth's atmosphere. "It is impossible to know enough about the recent and future state of the spacecraft and the space environment to make precise predictions," Molczan told Space.com. "The challenge seems not unlike that faced by meteorologists attempting to predict the landfall of a hurricane." The public can track the path of Progress 59 online via a satellite-tracking website like Heaven's Above or n2yo.com. It is likely that some leftovers of Progress 59 will survive the fiery dive through Earth's atmosphere and reach the surface, said Holger Krag, Head of ESA's Space Debris Office at the European Space Operations Center in Darmstadt, Germany. According to the Russian aerospace company RSC Energia – which built the spacecraft – Progress 59 is carrying propellant components, compressed oxygen, additional equipment that was needed to "maintain the station in good working order," equipment for science experiments, medical supplies, personal belongings and food for the crew. Altogether more than 5,200 lbs. (2,359 kg) of cargo is packed inside Progress 59, including 3,075 lbs. (1,395 kg) of dry cargo, 1,089 lbs. (494 kg) of propellant, 925 lbs. (420 kg) of water and 110 lbs. (50 kg) of compressed gases. The International Space Station is not in any danger of running out of supplies due to the loss of the spacecraft, NASA officials and the station's astronaut crew have said. Progress 59 is also known in Russia as Progress M-27M, and is one of RSC Energia's Progress M-M spacecraft series, an upgraded version of the previous Progress M-series line. According to RSC Energia representatives, Progress 59 is equipped with new devices for the motion control and navigation system and an improved onboard measurement system. All the devices are built around state-of-the-art electronic components and run the latest software. The upgrade made it possible to reduce the mass of the onboard equipment and thus enhance the capability to deliver payload to orbit.